Nick Pelletier rolls a ball up for G-NG at the Cross Insurance Arena. NEW GLOUCESTER—With the winter seasons in our collective rear view, but spring still several weeks out, now is an optimal time to reflect on the Patriots’ recent efforts. The Gentlemen Patriots turned in a fantastic season: As their current crop of players has gained experience over the past couple years, they’ve become an ever-greater threat to opponents. The team finished 11-7 in the regular season. They began their schedule with a 52-43 victory on the road at Lake Region (10th in B South), but then fell to 1-1 vs. York (fifth in A South). The Patriots next picked up three consecutive Ws – over Freeport (eighth in B South), Poland (13th) and Yarmouth (third) – before running into the Rangers of Greely, the eventual State Champions in Class A. The Patriots also notched regular-season victories over Sacopee Valley, Lake Region (again), Wells, OOB, Fryeburg, Poland (again) and Freeport (again), and thus entered the playoffs ranked fifth. There, they had a bye through the prelims and offed Spruce Mountain 57-34 in the quarters. In the semis, however, the Patriots succumbed 54-33 to Wells – a huge swing compared to the teams’ narrow matchup weeks prior, which, as mentioned, G-NG won. Three key seniors depart the team, come June: Rottari, Zac Brady and Oliver Grant. Mike Andreasen’s girls, the reigning State Champions, went 14-4 through the regular season, though they, alas, did not repeat at the top. The Lady Patriots picked up critical wins across their schedule, vs. the likes of York (fourth in A South), Freeport (third in B South), Poland (second) and Lake Region (fourth). The team’s Heal Points total earned them first – for the fourth consecutive year – as they entered the bracketing, and, obviously, a bye through the prelims. 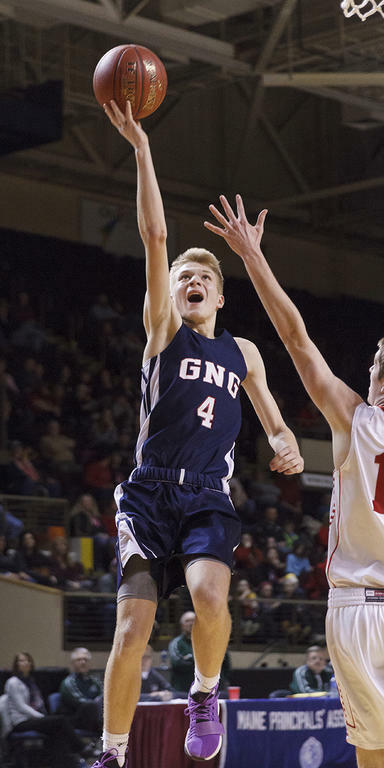 In the quarters, G-NG rolled easily past Spruce Mountain. In the semis, however, they faltered against friendly rivals Lake Region (the eventual State Runners-up), 34-31. The two squads have met multiple times in the same game in recent years. As mentioned, the Lady Patriots lose no players to graduation in June – a happy, lucky turn. Expect big things again from the team next winter. This year, G-NG contributed a quartet of boys to a co-op with Oak Hill, Poland and Leavitt, coached by Joe Hutchinson. Brandon Pelton and Garrett Haskins are G-NG seniors, while Andrew Topham is a junior and Sam Tibbetts a freshman. The team – known as the Kings – went 11-7 through the regular season, entering the playoffs ranked sixth. They fell, however, in the first round, No. 3 St. Dominic doing them in 5-1. Madison Pelletier, a freshman, served as G-NG’s girls hockey ambassador this winter, joining the Greely squad on their way to a standout season. The outfit went 15-3 across the regular season, and entered the bracketing ranked third in the North. They bested No. 9 Edward Little/Leavitt/Poland in the quarters, then No. 2 St. Dom 7-2 in the semis. Their Regional Final bout vs. Lewiston/Monmouth/Oak Hill proved a narrower affair, but they prevailed 4-3 in the end, and moved on to face South reps Kennebunk/Cheverus in the State Championship. There, the battled to victory 3-1. Head Coach Todd Mercer ushered a small, but tough, contingent to States this year. On the boys’ side of things, Andrew Peterson took fourth in the 55 Dash, running a 6.84 and raking in four points for his team. Peterson also stood out in the 200, where he finished sixth, in 23.89, and grabbed a couple more points. Ethan Ray, the only other Gentleman Patriot to compete individually at the season’s climactic meet, turned in a strong Two Mile, a 10:44.88, good enough for fifth – and two more points. G-NG also entered a pair of Relay outfits in the competition: Peterson, Sam Aube, Scott Lynch and Seth Levier combined for seventh in the 4×200 and Aube, Nick Cohen, Hunter Brown and Noah Bruns combined for the 4×800. All told, the G-NG boys finished by sharing 12th (of 23) with Ellsworth and Yarmouth. Over on the girls’ side: Madison Post, Nicole Cobb and Eliza Larrivee all participated in the in the 55 trials, with Post and Cobb advancing to the Final. There, Post finished third in 7.47 – just one one-hundredth of a second out of first (claimed by Junne MacIntire of Belfast) – and Cobb sixth, in 7.80. Cobb finished 14th in the 400, Erica Schlichting eighth in the 800 and Jasmine French 17th in the Long Jump. Finally, the Shot Put trio of Zoe Barnes, Megan Reynolds and Caitlyn Smith – G-NG has established a great tradition in the girls Shot Put in recent years – finished fifth, 13th and 24th, respectively. In the Relays, Cobb teamed up with Larrivee, Jaley Martin and Lindsay Pierce for ninth in the 4×200, while Abigail Dulac, Abbey Chandler, Lily Wilson and Liza Sturgis handed off in the 4×800. In the end, the Lady Patriots shared 14th place with John Bapst. Jeff McEvoy coached a pair of boys to States this winter. Will Maines and Mike Sutherland finished back-to-back – in 38th and 39th in the Classical race; the duo also finished close to one another in the Freestyle race, with Sutherland taking 24th and Maines 28th. Similarly, Sutherland finished 32nd in the Pursuit competition, and Maines 34th. Mikayla Ryan cuts inward on the attack for G-NG in a playoff appearance.